William Hunter is an architect, urban designer and teaching fellow at The Bartlett Development Planning Unit (DPU), University College London. I recently caught up with him to discuss his new book, "Contested Urbanism in Dharavi: Writings and Projects for the Resilient City," a collaboration with Camillo Boano and Caroline Newton. Dharavi — perhaps the most famous informal settlement in the world — has featured on Polis many times and we're excited to return via William's experience. The book is a culmination of work dating back to May of 2009, when a group of students from the DPU's Building and Urban Design in Development program travelled to Mumbai for a three-week research trip. Professor Camillo Boano led the project in collaboration with SPARC, an Indian NGO focused on housing and infrastructure for the urban poor. I was a student in the course, and for most of us it was the first time we'd encountered such extreme informality — from the harsh living conditions to the flourishing economic activity and political activism. This was an arena in which conflicting processes of empowerment and exploitation make comprehensive transformation seem unattainable. Grappling with what we found in Dharavi from practical and theoretical points of view, we arrived at a studio module for the next three years. The attention and collective effort given during this time warranted proper documentation — compiling the group's research, reflections and project work into a single volume. Former students, DPU staff and many others helped us prepare the book for publication. There seemed to be thousands of microscopes pointed at this plot of land in central Mumbai with the powerful, if unsubstantiated, epithet "Asia's largest slum." Dharavi was at the tip of everyone's tongue — in academia, in the media, in works of non-fiction and fiction, even in cinema. Release of the movie "Slumdog Millionaire" earlier that year created a somewhat glamorized image of slum living that seemed worth interrogating. Our involvement was part of this wave of intrigue, but with a challenging objective. The DPU had established longstanding relationships with SPARC, Homeless International and Slum-Dwellers International (SDI) as well as their national affiliate, the National Slum-Dwellers Federation (NSDF). We knew that we weren't the first student group to land in Dharavi, though we felt at the time — and still do — that we were approaching the situation differently from the way others had. We shared an affinity for the architecturally driven projects by groups from Columbia University and TU Berlin, but were focused more on studying the roots of social problems and the experience of local communities. We wanted to understand the power relations at play in "slum upgrading" plans in order to inform a participatory design process. What did your group focus on? What's interesting is that Dharavi isn't even Mumbai's largest slum, let alone Asia's. The peri-urban Mankhurd-Govandi and Dindoshi settlements, for example, have eclipsed Dharavi in size and estimated population. But because of Dharavi's prime location at a potential transit hub just south of the Bandra Kurla Business Complex, it's caught up in conflict over Mumbai's future development. The Dharavi Redevelopment Project (DRP), a scheme proposed and managed by architect-consultant Mukesh Mehta following a report produced by McKinsey and Company in 2003, aimed to establish a foundation for transforming Mumbai into a "world-class city" free of informal settlements. Hypothetically, this would be a great thing; living conditions are dire, with an alarming lack of basic services. But the DRP involved suspect means of implementation: among the approximately 40,000 square feet of private residential and commercial space, each Dharavi household would receive only 270 square feet of resettlement housing, and only those who could prove that they'd lived in the settlement prior to the year 2000. The project threatened places of residence and employment. Its profit-driven approach placed residents on the defensive, rendering Dharavi a perfect storm of contested urbanism. Would you say that contested urbanism is a new global phenomenon? It's not a new phenomenon, but definitely global. The Occupy Movement is a viral example. It involves conflicts over local space that extend to conflicts over governing the commons at other scales, over access to local and global resources. Urbanism also involves reading and investigating a place. While it seems like a familiar idea, we attempted a more critical interpretation through the notion of contested urbanism. We wanted to unpack the many different and at times contradictory power relations at play in Dharavi. We were also thinking about how similar processes take place in other settings around the world, and how to confront them in theory and practice. How did you confront these instances of local and global spatial conflict? We examined relationships between space, politics and society. Our approach is rooted in Lefebvre's "production of space," Heidegger's "human spatiality" and Foucault's assertion that "space is fundamental in any exercise of power." We also drew upon Lefebvre's "right to the city" and the "critical regionalism" of Alexander Tzonis and Liane Lefaivre. These concepts shed light on conflicts between people and top-down control over urban development. The inner conflicts of development practitioners required attention as well. When we visited Dharavi and began writing about it as a studio case study, a focus on contested urbanism helped us escape the tendency to think mainly in terms of design solutions. It served as an alternative way of thinking, of enriching the possibilities for critically assessing and acting within a highly complex urban setting. Resilience comes up often in urban planning and design, often without much critical reflection. What role did it play in your project? In the face of struggle for equality in the city, and certainly in the wake of natural and manmade disasters, the idea of resilience is very important. The ability of individuals and communities to address immense challenges is based on unwavering effort. We see this all over the world: in southern Louisiana — where I grew up — following Hurricane Katrina, in the massive rebuilding underway in Haiti. The list goes on and on. But the everyday resilience in Dharavi is unmatched in terms of DIY building and economic activity. Almost everything in Dharavi is part of an informal process, from the sanitation systems to the electrical grids. There is a profound coping mechanism on display, with people adjusting to a severe lack of services and a precarious future. Yet Dharavi's streets are as vibrant and bustling as those of any "global city." You can find almost anything in its markets and much of the goods are actually produced locally. I remember an article in the Economist that estimated the value of annual production in Dharavi at $500 million, and much of it is sold outside the settlement. This activity in the midst of such unhealthy and unjust living conditions is evidence of profound resilience. What is in store for Dharavi, and what implications might this have for addressing urban poverty worldwide? In Dharavi, the latest news is that the DRP has been momentarily thwarted by grassroots opposition. The Indian Alliance (SPARC, NSDF and Mahila Milan) and the Special Advisory Committee of Experts appointed to "humanize" the DRP have contributed substantially to this effort. It is a great achievement, calling attention to the need for revising policies like the Slum Rehabilitation Act, which places unfair limits on eligibility for resettlement housing. A parallel issue is recognition, which has always been an obstacle in Dharavi and other informal settlements. The government just doesn't know how many people live in these areas, as surveys quickly become outdated with the constant flow of urbanization. Securing accurate population data is a positive step toward upgrading infrastructure, housing and services. Informal settlements place unique demands on mainstream planning. Their strengths and weaknesses have to be taken into account when approaching redevelopment. Projects like Homegrown Cities can help by supporting local solutions to housing development and preserving resident livelihoods. Engagement with contested urbanism requires critical, inclusive and locally specific problem-solving. People will continue to overcome obstacles and outperform expectations. This is evident in Dharavi and in so many other settlements around the world. Informal resilience and DIY ingenuity show that cities can be built and governed from below. At the same time, slum residents require and deserve the same level of services that other members of society receive. 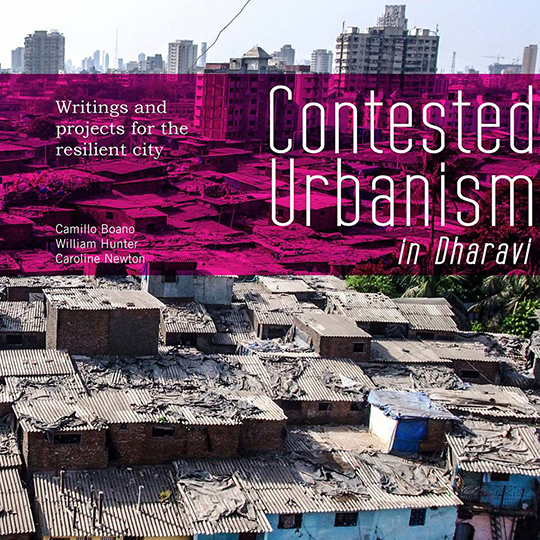 Advance copies of "Contested Urbanism in Dharavi: Writings and Projects for the Resilient City" can be purchased by sending an email to dpu@ucl.ac.uk. Credits: Photos by William Hunter. great interview. it hadn't occurred to me before, your point about informal settlements showing that design, construction, employment, and governance can be generated from below. very important to keep in mind while finding ways to upgrade infrastructure and services. Good article, a nice reminder of space and power too. Thanks for sharing.